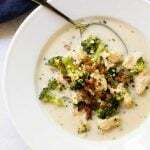 Warm and cozy broccoli chicken soup for two made with bacon, cream, and plenty of tender chicken and broccoli. For a long time, I considered soup-making a kitchen project in the sense that you set aside time and make a big batch of soup to freeze for lunches and easy dinners. And while I still like to do that sometimes, in the past year I’ve come around to making smaller batches of soup. A batch that makes two or maybe three servings. That way, I’m not committed to a stack of frozen plastic containers that take up room in the freezer only to wonder months later – because I always forget to label things – what the heck is this brick? So when a soup mood strikes I stop and ask myself do I want a lot or a little? Do I want a long-term commitment with this soup or just a couple of fun nights? But beyond just basic soup commitment issues, there are other factors. This broccoli chicken soup, full of tender chicken and good-for-you broccoli, gets a dose of cream at the end. It’s a delicious addition, but not necessarily freezer-friendly because cream-based soups tend to separate and get funky when frozen. If I made a big batch I could freeze the soup without the cream and add it in when it’s thawed and warmed up, but I don’t always have cream on hand and so the frozen soup ends up buried in the freezer only to be excavated months later and tossed out. So, again, all roads led to a small batch of soup. 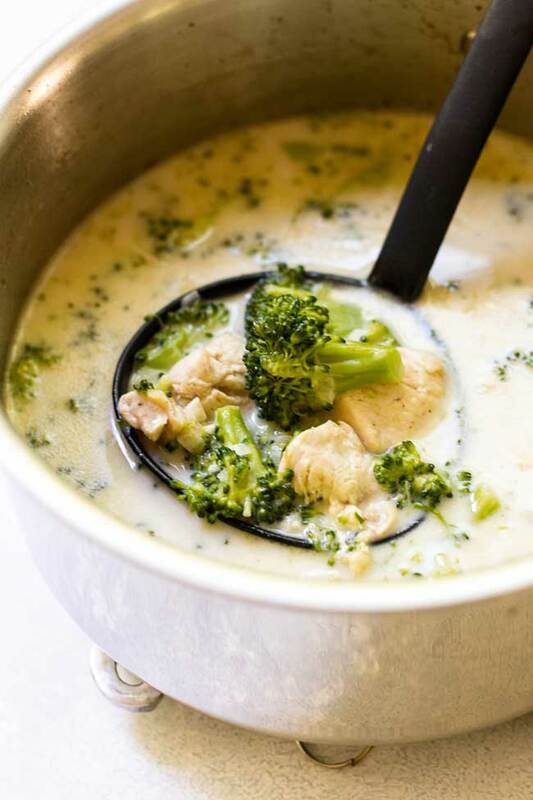 In this case, a cozy couple of bowls of creamy broccoli chicken soup. It starts with bacon. Preferably thick cut bacon. Once the bacon is crispy, cook the onion and garlic in the bacon fat that’s left behind. I used a simple boneless, skinless chicken breast cut into bite-sized cubes. Store-bought chicken stock. Depending on the kind you use (i.e. low-sodium) you will want to taste test your soup and adjust the salt. To thicken the soup, I mashed some butter and flour together in a small bowl. I added a little hot stock and whisked it until smooth before adding it to the soup. Heavy cream. Just enough to add some richness. 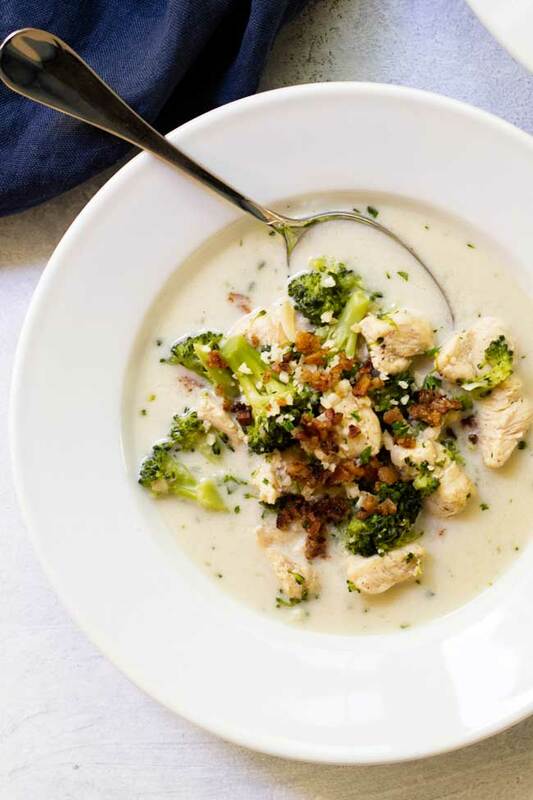 Creamy broccoli chicken soup for two garnished with crispy bacon and Parmesan cheese. Cook the bacon over medium heat in a 3-quart saucepan until crispy. Remove the bacon reserving the fat in the pan. Add the onion and garlic to the pan and cook it for a few minutes, or until it starts to soften. Add the chicken, stir and cook it until it’s no longer pink on the outside. Add the broccoli and chicken stock. Raise the heat to bring the pan to a boil, and then reduce the heat to maintain a simmer. Simmer the soup for 15 minutes. While the soup is simmering, mash the butter and flour together in a small bowl. Add about a 1/4 cup of the hot soup (liquid only) and whisk to combine. Add the butter/flour mixture back to the soup and stir. In the last five minutes, add the cream and 1/2 tablespoon chopped parsley. and stir to combine. Let the soup simmer another five minutes and, meanwhile, finely chop the cooked bacon. To serve: top each serving with some chopped bacon, the rest of the parsley and Parmesan cheese. If making the soup ahead of time (or if you plan to freeze part of it) leave the cream out. It won’t hold well if chilled or frozen. Only add the cream once the soup is warmed-up and you are ready to serve it. Absolutely delicious! And easy to make!